Fake tan used to fill my mind with thoughts of streaky legs and orange arms, that was until last Wednesday when i was invited along to the launch of Skinny Tan’s new 1 hour express mousse at Farm Girl cafe. Usually you have to wait around 5 hours for a tanning mousse to develop but with the new mousse you can see results within 1 hour, i’ve been testing out this and some of the products from the range to see if they live up to the claims..
I’m a big fan of brands with a good ethos and it was lovely to hear all about skinny tan at the event, all the products use natural tanning agents and natural skin smoothing actives, (hence the name “skinny tan”) and all of the products are cruelty free and vegan certified. First things first i want to talk about the dual tanning mitt, never before did i think i could be in love with a mitt but here i am.. When i read the packet and the words “true velvet luxury” i didn’t think they were being serious, that was until i opened the mitt to be met with actual velvet (i spent a good few seconds stroking the mitt, i won’t lie to you). This makes application so much nicer, you can tell just by feeling it that it’s an incredibly high quality, well made product that actually makes me enjoy tanning. I’m ashamed to say i haven’t used good quality mitts in the past but after using this i will never go back! The pre tan primer actually makes me excited about exfoliation because it just makes such a difference to my skin and the finish of the tan i apply; i didn’t realise how bad my knees were until i actually started using this and realised how good they could look after good exfoliation. The consistency of this is quite thin, but the bits inside do an amazing job at prepping your skin before tanning. I use this in the shower or bath a few hours before tanning and I’m left with even, smooth skin – a perfect base for a tan. My new found skinny tan collection also contains the exfoliating mitt which you can actually remove old tan with, the orange side of the mitt has professional level dermabrasion which means you can correct your tan if it goes wrong, or buff away stubborn old tan buildup before applying a fresh layer. This is really good if you’ve been lazy with exfoliation lately and you need a really good powerful exfoliator to get rid of dry skin on those dreaded areas like knees, ankles and elbows. Also there’s nothing worse than finishing your tan and realising that you’ve built up too much in one area, so you can use the orange side of the mitt to buff away any mistakes. I’m as pale as a ghost so when i saw the words “ultimate dark” i have to admit i almost dismissed the 7 day ultimate dark tanner, but after trying out the other products i was feeling adventurous and decided to give it a go. This is now my favourite tan, when i squeezed this out and saw it was as dark as chocolate i did have a little panic but as soon as i started applying this i knew i was going to be okay. This is almost effortless, i really don’t know how it happens but it just seems to blend with your skin; I’m not experienced when it comes to tanning but a complete newbie could apply this perfectly. I was really surprised at how well this goes on, the finish is so even and so natural you’d think my usually pale skin had been in sunnier climates for a week and actually managed to get a tan. I applied this sparingly and left it overnight to develop and it left me with a beautiful natural tan, the products are really cool toned so you don’t run the risk of turning orange and i can confirm..it doesn’t ruin your bed sheets! 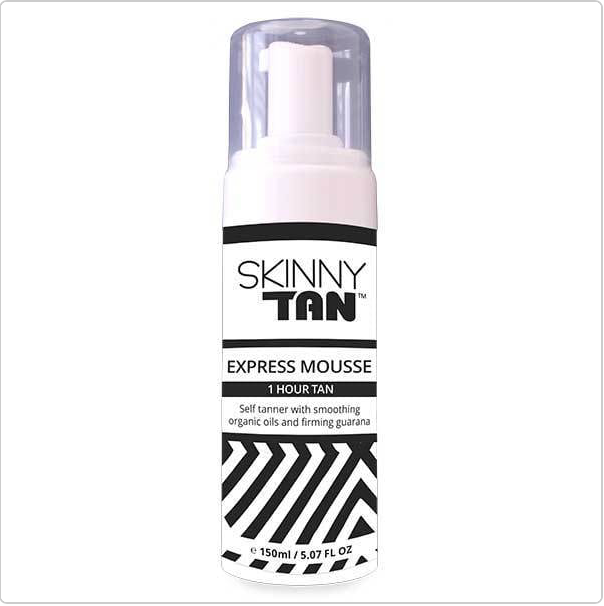 Finally we have the express mouse, just like the original 7 day tanner this is impossible to streak, so much so much that skinny tan offer a money back guarantee on their products because they’re so confident you’ll love them. A lot of tan brands make claims like that but i haven’t heard of any others that are so confident in their products that they actually offer a guarantee, especially when it comes to self tan. The mousse went on evenly and provided a natural tan within three hours, you can leave this on for as little as 1 hour to get a light tan or overnight to get a really deep tan. Like i said i left this on for around three hours and the results were really good, the people from skinny tan talked about this as a kind of customisable tan where you can find your perfect timing whether that be a 30 minute tan or a 4 hour tan. My inner laziness also comes out when i realised even though this feels like a quick fix it still lasts up to 14 days, no tanning for two weeks? Yes please. Follow me on TWITTER / INSTAGRAM / BLOGLOVIN. The products featured in this post have been gifted to me for reviewing purposes. I've only tried the express mousse so far, but I really like it and its coconut scent! I was pretty scared when I saw the 'ultimate dark' tan, but now you've said its okay, I'm deffo going to give it a try! I'm really bad with fake tan, every time I try and use it I end up with patches of different coloured skin. These products look so great. As a naturally tan person, I usually get more pale and yellow toned in the colder months and I hate it as I don't look like myself. I'm always wary with fake tanning because I don't want to over do it, especially as I'm naturally dark but I like the fact that you can leave it on for as long or as little as you like!